Margie Warner, 97, a lifelong resident of Jaconita, passed away peacefully on Friday, November 30, 2018 of natural causes at her home in San Pedro surrounded by her loving family. Margie was born October 1, 1921 in Jaconita. She was an active member of Nuestra Senora de Guadalupe in Pojoaque. Margie worked hard all her life to provide for her family. Margie was preceded in death by her parents, Jose Ascencio Lujan and Roseabelle Lujan; adored grandson, LCpl Jonathan Grant whose life was taken while serving in the Iraq war; son, Staff Sargent Bobby Trujillo whose life was taken while serving in the Vietnam War; first born infant child; brothers, Gilbert Lujan Sr. and Arsenio Lujan; sisters, Cornelia Gonzales and Katie Ortiz; nephews, Lloyd, Dixie and Steven Ortiz, and Aaron Roybal; one infant great-great-grandson, Jacob Brian Brewer. Margie is survived by her six children; Carol Brewer, Angie Lovato, Janet Olivas, Grace Romero (Mark), Alma Roybal (Larry) and Walter Grant (Maxine). 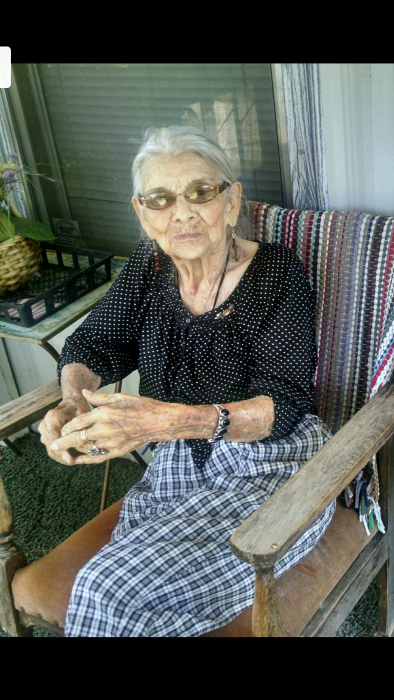 Margie is survived by 28 grandchildren, 58 great-grandchildren and 29 great-great-grandchildren; sister, Mary Diaz; a special sister-in-law, Emily Lujan; a very special son-in-law, Ramon Olivas; special caregivers, Janet Olivas, Alyssa Quintana, Rosa Valdez, Alma Roybal, Julian Valdez, Elena Chavez, and many other relatives and friends. Pallbearers taking Margie to her final resting place are her grandchildren. Public visitation will begin on Thursday, December 6, 2018 at 6:00 p.m. in the Sangre de Cristo Chapel of the DeVargas Funeral Home & Crematory with a rosary to be recited at 7:00 p.m. Mass of Christian burial will be celebrated on Friday, December 7, 2018 at 10:00 a.m. at the Nuestra Senora de Guadalupe Catholic Church in Pojoaque. Burial will follow at the Pojoaque Cemetery. Honorary pallbearers are her many grandchildren and great-great-grandchildren. The family of Margie Warner has entrusted the care of their loved one to the DeVargas Funeral Home & Crematory of the Espanola Valley.